1. Place the onion, garlic, herbs, harissa, spices and salt in a food processor and blend until finely chopped. Add the lamb and blend again until combined. Scrape down the sides and repeat once more. The finer the texture, the better the meat will stick to the skewers during cooking. 2. Divide the mixture into 12. With dampened hands, pack a portion of the kefta mixture around each cinnamon stick, taking care to form an evenly distributed cylinder with about 2.5cm of cinnamon stick showing at each end. Once formed, rub a little bit of olive oil over each one. Set aside in the fridge for at least 30 minutes, or until needed. 3. Preheat the oven to 200°C, gas mark 6. 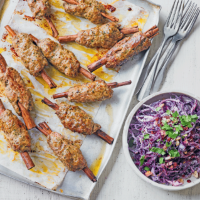 Place the skewers onto a baking sheet and cook for 20-25 minutes, turning once, until cooked throughout. Serve hot with extra rose harissa, for dipping.